Valid for stays Thursday to Monday until 30 September 2019. Subject to availability. Discount is off the Best Flexible Rate in Standard, Superior & Executive Rooms. Must be booked direct with the hotel a minimum of 10 days in advance. Valid for stays Thursday to Sunday for travel until 30 September 2019 Must be booked direct with the hotel. Conditions apply. Subject to availability. budget for this to allow for reinvention. •	Good governance is a team activity. It is important to discuss the “weak signals” – which individuals pick up on but they tend to be ignored in team discussions which tend to be focussed elsewhere instead. These “weak signals” are often snippets of information that point to change. I am sure this will provide you with some good discussion points for your next meeting! On that note, congratulations to our great examples of clubs that have become finalists in this year’s Awards for Excellence! These awards are a great way to review your club governance as well as provide deserved recognition to club teams that have worked tirelessly throughout the year. Tickets are now on sale for our “night of nights” and I encourage your club to support this event as we showcase our industry to government and the community of WA. For more information please contact Sam in the office on 1300 640 616. Made with fresh garlic. Authentic recipe based on our whole egg mayonnaise. Delicious, rich and creamy – blended with zesty Tabasco® sauce, sour cream, tomato and spices. The well balanced heat and creamy texture of our wasabi mayonnaise creates the perfect complement to seafood, poultry and sushi. Bursting with the distinctive flavour profile of gherkins, capers and mustard, this creamy sauce is a delicious enhancement to any seafood dish. of what they wanted and they basically came up with their own agenda that appealed more to a younger demographic. make sure that people have an understanding. It also helps you all be on the same page and recognising that everyone has a bias. 4) Seek the diversity you want. This may involve some time and effort on behalf of the club in order to engage with the group you want. 5) Unite with different groups over a social issue. Let’s say a club wants to tackle the issue of homelessness. If it’s promoted as a social issue, you are bound to get people who are attracted to that as opposed to, “we’re looking for 18-25 years old who are passionate about this.” If it’s around an issue, you attract a different group of people. Committee Restructure Restores Volunteer Enthusiasm TARQUIN BATEMAN, WRITER - CLUBS WA Three years ago, Coogee Beach Surf Life Saving Club (SLSC) decided to completely restructure the way their club was run. Each side of the business has a Vice President (VP), three Directors under each VP and a team of officers under each Director, totalling over 60 committee roles. They cut three positions from the board, introduced an immediate past president mentoring program and created role profiles for each job within the Club. While 60 may seem like too many, it is important to remember that Coogee Beach SLSC has a membership base of over 1,200 and requires roles like age-group managers, competitions coordinators, lifesaving captains and training officers in addition to normal club management. The end goal was to avoid volunteer burnout, engage their rapidly growing member base and maximise the potential of their new Integrated Community Facility. Coogee Beach SLSC President Nick Neal drove the change, recognising an opportunity to avoid the pitfalls of traditional Club Management Structure and restore the solid foundations the Club was built upon. “The intent was still to have a management committee at a board level, but also to have each director have a sub-committee of their own working on issues in their specific departments before it goes to the relevant committee meeting,” said Nick. “I could see where the club was going, and they needed someone who could sit back with perspective and help create a strategic approach for bringing it into the future successfully,” he said. “Once issues have already been worked through by sub-committees, they can go to the Board meeting for a final decision, or the sub-committees can resolve it on their own. Prior to the restructure, the Club had a problem with distribution of responsibilities. Volunteers in senior management roles were getting discouraged, losing enthusiasm and burning out quickly. The main problems arose from a sudden increase in the Club’s membership base which increased pressure on Committee members. Initially the Club tried creating new positions on the board each time a new job needed to be done. “The board grew to 13 people with the directors still trying to run everything in the club by themselves,” said Nick. “People were doing odd jobs all over the place, it just didn’t work.” Instead, Coogee Beach SLSC split all Club roles into either ‘wet’ or ‘dry’ sides of the business. ‘Wet’ being beach operations and ‘dry’ being club operations. PUTTING MEMBERS FIRST Recent feedback survey offers interesting insights. With current media attention focussed on the superannuation industry, we thought we’d share some insights from our recent annual member feedback survey. Our survey is designed to measure how well we support our members to make decisions about their super. Whilst we were pleased with the positive sentiment expressed by our members, there is still a lot of work we can do to improve the community perception of an industry that potentially impacts the life savings of many individuals. Trusted Brand Despite the adverse publicity surrounding superannuation, industry super funds have maintained the respect and trust of the general public. In our survey, the results confirm that our fund is perceived as a highly trusted fund by 9 out of 10 members which is well above the industry average of 6 out of 10 members*. Meeting Members’ Needs 4 out of 5 members said they would recommend Club Plus Super to others. In addition, members are also confident (88.9%) that our fund meets their needs. These results acknowledge our commitment to meeting or exceeding member expectations. *CoreData, Industry Superfunds, Member Engagement Survey August 2018. **Past performance is no indication of future performance. ***Based on SuperRatings SR50 Balanced (60-75) index for the financial year ending 30 June 2018. https://www. superratings.com.au/2018/07/19/super-members-can-expect-a-better-second-half-to-2018/ Read the PDS issued by Club Plus Superannuation Pty Limited ABN 26 003 217 990, ASFL 245362, the trustee of the Club Plus Superannuation Scheme, ABN 95 275 115 088 before making a decision. New motorcycle safety campaign urges riders to Ride to Arrive In 2017, 346 people lost their lives or were seriously injured while riding motorcycles on WA roads. in their brain how ridiculous some of these products were,” said director Paul Komadina. The State Government has ramped up its community safety education to make Clubs WA members and the wider community more aware of the risks involved in riding a motorcycle and highlight the safety features that are now available on bikes to improve the safety of riders and their passengers. The MotoCAP website now puts Australian motorcycle protective gear through a rigorous testing regime and gives ratings for protection and comfort to help riders choose the safest pants, jackets and gloves for riding. The results of independent testing of motorcycle helmets can be found on the Consumer Rating and Assessment of Safety Helmets (CRASH) website, with a star rating from 1 to 5 awarded for safety and comfort. From November 2019, a new Australian Design Rule requires all new motorcycles sold in Australia to be fitted with an Advanced Braking System (ABS), which according to an evaluation into the effectives of ABS on motorcycle safety, could result in a 31% reduction in death and severe injury in a crash. “It’s actually quite simple to be safe on a motorcycle,” said Motorcycle Riders Association of WA President Dave Wright. “You need to be aware of your surroundings, of your own abilities and aware of the capability of your motorcycle.” For more information on how to stay safe on your motorcycle, visit the Road Safety Commission’s safety pages on motorcycles and motorcyclists. PETER MAZANEC, WRITER - CLUBS WA The pressure was on at Armadale Senior High School as some of the Club Industry’s top chefs and cooks competed for the Clubs WA Chef’s & Cook’s Challenge crown on the 25th March 2019. This year, Club chefs and cooks were tasked with making their tastiest burger followed by a main course in the mystery box challenge. The mystery box challenge required the challengers to plate a dish using one or more of the five ingredients from the mystery box which included fennel, two-minute noodles, Coke, jaffas and last but not least, coco pops! The challengers did not fail to deliver, with delicious burgers and incredibly creative main courses served up to the competition judges, Brendan Dugan, Rohan Wills, Gerhard Steiner, Brian Dunnage and Michelle Tilly. Clifton Phillips from Gosnells Golf Club and Dean Williams from Lake Karrinyup Country Club were the big student winners on the day, with the chefs taking out the Student Choice Award in their respective rounds. The overall winner will be announced at the Clubs WA Industry Awards for Excellence night on 29th June. Clubs WA would like to say a big thank you to all our challengers for their contributions and to our wonderful sponsors, Stoddart, Birch & Waite, and Armadale Senior High School for making this event a huge success. Lexington Hill Cocktail Club is the largest draught cocktail brand on premise in Australia, and we’re bringing Espresso Martini & Margarita on the Rocks to off premise to continue to drive the growing wave of cocktail culture. No mixing required, simply grab your glassware and garnish for a perfect cocktail every time. Oatley Fine Wine Merchants is thrilled to maintain their long-standing partnership with Clubs WA. We are a family owned wine partner committed to providing an exceptional beverage experience for your members. With over 600 products to range from ‘first pour’ wines to fine wines, glassware and water. Oatley Fine Wine Merchants is Australia’s fastest growing wine business, partnering with some of Australia’s most successful family owned wineries, who all share the same philosophy and commitment to quality. Our support programs include wine list design and production, reward programs for members, staff training, community support initiatives and themed promotions. Robert Oatley Vineyards has over forty years - experience in wine making in Australia. The vineyards are tended organically where possible and wines made with minimal intervention. Wines are crafted for varietal clarity and focus, reflective of their ‘sense of place’, are modern, fashionable, and are “Wines of character and integrity”. (including full time study!). I have since managed to get a full-time job as a digital content manager, and I truly believe that completing an internship with Clubs WA gave me the experience that helped me stand out from the crowd. I would recommend that university students and graduates in the areas of writing, journalism, marketing, business and communications get on board with such a great opportunity. I can’t thank the team at Clubs WA enough for offering such a fantastic experience and I am very grateful for the role that this internship played in kickstarting my career. 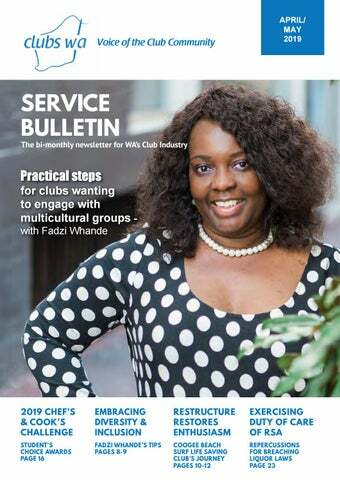 The future of club licences and the trend of clubs converting to taverns In speculating on the future role of the club licence and the trend of clubs converting to tavern, one is aided by reflecting on the past. Historically, club licences were very different from all other types of licences. They were also distinctly different from what they have become today. Going back as far as the early days of the 1911 Licensing Act, persons enjoying the privileges of membership of a members’ club which was registered under that Act could be supplied and were permitted to drink liquor at the club. However, strictly speaking as the law then stood, there was no sale of liquor. In those early days registered club premises did not become licensed premises within the meaning of the Act. To be registered, they could not be ‘proprietary’ ie, commercial in nature. The drinking times were limited. Further, the part of the premises into which ‘strangers’, ie non-members, could lawfully access was very restricted. Over the decades, the nature of club licences progressively changed and the privileges slowly expanded. Despite that, the rules and regulations preserving the underlying private element coupled with the membership requirement still remained. By so doing there were obstacles initially in obtaining and thereafter in maintaing liquor licensing approval. With the introduction of the 1970 Liquor Act, licensed clubs became clearly defined in their roles. This has continued ever since as the essential or inherent difference compared to other liquor licences has remained. They continue to be private rather than public facilities. This aspect is in contrast to the tavern licence which was a new concept introduced in the 1970 legislation. In the decades since 1970 it has become apparent to a number of clubs around the State that not only would the interests of their members but also elements of the local communities be better served with a more flexible licence. This is where the tavern licence has become very relevant as has the special facility sports arena licence in some cases. The most recent amendments to the Liquor Control Act have again further loosened some aspects of visitor and guest use of licensed club premises. But despite the ongoing relaxation of visitor usage, there continues to remain the same inherent complications of addressing the two key prerequisites to any club licence. One is the need to maintain a common interest amongst the users of the facility. The other is the quite complicated statutory requirement as to the rules of the club. The trading hours of clubs compared to taverns these days do closely resemble each other. Increasingly, clubs are seeking more flexible licence conditions which only a tavern licence can offer. These factors have in some cases motivated change. As the differences between licensed clubs and tavern licences diminish as to usage and continue to blur, one can confidently speculate that the trend of some traditional licensed clubs wanting to convert to taverns will increase. The commercial appeal of a tavern licence coupled with the ability of avoiding some of the obligations of complying with the cumbersome rule requirements do add to the attraction of a tavern. The conversion is not always simplistic, however firstly, it is necessary for club members to agree. It also requires appropriate zoning of the site and the ability to make the change which will be dependent on the wording of the lease. Those clubs incorporated under the Associations Incorporation Act would still need to comply with that Act. In order to obtain a tavern licence, a club would need to establish that it has exclusive tenure over the licensed premises at all times. That means, clubs that share their facilities with other clubs or organisations will need to resolve their tenure issues before applying for a tavern licence. Finally, the change in licence would still need to pass the public interest test to gain licensing authority approval. Our annual Chef’s and Cook’s Challenge was held on the 25th of March at Armadale Senior High School, where our chefs were put to the test to cook the best hamburger and mystery box main course possible. The challenge tested their ability to perform under time pressure, their creative abilities, and their overall cooking skills. Every single Challenger did an incredible job, somehow managing to make palatable main meals from ingredients such as Coco Pops and Jaffas. The winner will remain a secret until the Industry Awards for Excellence ceremony… The Industry Awards for Excellence are approaching rapidly and I would love to thank everyone for sending in their amazing nominations. We are so excited to celebrate these achievements with you all on the night and I can’t wait to see everyone there. Tickets are available online at www.trybooking.com/474429; alternatively, message events@clubswa.com.au for a registration form. EXCERCISING DUTY OF CARE AND THE RESPONSIBLE SERVICE OF ALCOHOL PETER MAZANEC, WRITER - CLUBS WA Responsible service of alcohol is an important issue for any licensed club, as the legal repercussions for breaching liquor laws can be severe and life changing. Exercising duty of care is critical to protecting your club from the implications of a night out gone wrong. While the High Court of Australia ruled in 2009 that Licensees are not generally required to take care to prevent harm to patrons who become voluntarily intoxicated, the line between exercising duty of care of the premises and personal responsibility involving alcohol can still be a blurry one, as the following case illustrates. In 2002, Tandara Motor Inn staff came under scrutiny for knowingly allowing an intoxicated patron to drive home, ultimately resulting in his death. The patron, Shane Scott, was more than five times over the legal blood alcohol limit when his motorcycle crashed into a bridge. Around 6pm, Scott had handed over his keys to staff and agreed he would telephone his wife in order to pick him up when he was ready to leave. His motorcycle was to be locked in a storage room and collected the next morning. After becoming intoxicated around 8pm, staff refused Scott service. He became aggressive and demanded his keys be returned. The Licensee attempted to call Scott’s wife to pick him up, but Scott would not give them her number. Despite the bar staff’s efforts to reason with Mr Scott, he insisted several times he was ‘right to drive’ and took his keys back. After leaving at 8.30pm, he lost control of his bike just 700m from home and tragically passed away. The Licensee then sought leave to appeal to the High Court of Australia, which ruled in favour of Tandara Motor Inn and found that the premises discharged its duty of care to Mr Scott by offering to call his wife to come pick him up. The court noted that while the premises had no legal right to withhold personal property, it was unclear as to whether the duty of care or lack thereof was the cause of Scott’s death. This case demonstrates how difficult it can be to determine when a premises duty of care ends and a patron’s personal responsibility begins. The best defence against potential fines, lawsuits, injuries or a death due to alcohol caused by negligence is thorough training. RSA training is vital to protect patrons, management and staff from legal repercussions, and quality RSA training provides staff with the knowledge and strategies to avoid negative outcomes. A practical way to support your RSA trained staff in fulfilling their duty of care towards customers is by keeping a breathalyser on your premises. A breathalyser can be utilised by patrons to check if they are okay to drive, or to simply monitor their own drinking. Not only can breathalysers enhance your club’s image when it comes to promoting patron safety, it can also be a source of revenue for your club. If you would like to know more about acquiring a breathalyser for your premises, Clubs WA can help. We are currently offering a special rate on a wall mounted breathalyser, the Andatech Soberpoint 3 (RRP $3200) for only $1650 plus GST. Soberpoint breathalysers are easy to install and use, come with the convenience of Paywave software, and have low maintenance requirements. The revenue stream that will keep your staff, patrons and members safe. It is considered good governance for an association to have clear guidelines determining the boundaries between the duties of the board/committee and the managers of dayto-day activities. It is good practice for an organisation to adopt two documents to provide clarity regarding the definition of board and management activities: a ‘statement of matters reserved for the board’ and a ‘delegation of authority’ policy. An organisation following good governance practice will also have a board charter or terms of reference accompanying these two documents. When drafting these documents, consideration needs to be given to the association’s constitution. defining the role of chief executive officer (general manager) in a job description ensuring that key performance indicators (KPIs) are in place to measure the performance of the board, and management team ensuring that financial reports are prepared and reviewed by the board including: - Statement of income and expenditure - Statement of assets and liabilities - Statement of cash flows ensuring adequate internal control frameworks and risk management systems ensuring that succession plans exist for key staff within the association ensuring that to the extent possible within the requirements of the constitution, succession plans are developed for board members. It can also be useful to ensure some associations, board members may be involved as volunteers in operational matters. In such circumstances, board members need to be aware of which ‘hat’ they are wearing and consider their responsibilities accordingly. In such circumstances, careful consideration should be given as to how they report to the board, which is best done through management. For more information on good governance and how it may affect your association, contact Daniel Papaphotis at FAJ Auditing - email daniel@faj.com.au or call 9335 5211. Make sure to mention Clubs WA to receive great deals and discounts from suppliers. The Road Safety Commission is a proud Partner of Clubs WA.